CULPEPPER COUNTY handed out newly designed “I voted!” stickers on Election Day thanks to a new design submitted for a competition by fourth-grader Natalie Nicholson, 9, CBS News reported. “I wanted to do the American flag and Virginia, so I said why not just put it all together? So then I just did American flag, Virginia in the middle, and then in the middle of Virginia, ‘I voted.’” Nicholson said. “There was no close competition to Natalie’s sticker. She did a really great job,” James Clements, the county’s director of elections, told CBS News. 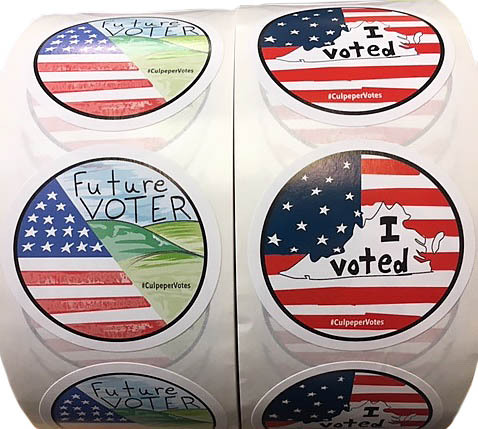 Future voters got their own sticker too, thanks to a design by local high school senior Jeffrey Maldonado. ● LOS ANGELES COUNTY recently cracked down on cockfighting after the largest cockfighting bust in U.S. history last year, a Humane Nation reported. The county sheriff’s department and county animal care and control were on the scene to document nearly 8,000 birds on an 80-acre property. Investigators found sick and dying birds as well as knives and training equipment. As a result of the bust, the county passed an ordinance that went into effect this fall that limits the number of roosters that residents can keep on private property. Up to 10 roosters can be kept on a large lot. The ordinance was drafted by the county’s department of animal care and control and introduced by Supervisors Kathryn Barger and Sheila Kuehl. Do you have something for News From Across the Nation? Contact us here. ● FULTON COUNTY Commissioner Bob Ellis recently introduced the “Text 4 Help” program to county schools and county government, the Marietta Daily Journal reported. The program’s goal is to relieve youth stress and anxiety. The anonymous crisis text line is aimed at providing a valuable resource for students seeking support or an outlet to share concerns. “We are so proud to be the first in the Southeast to launch the Text 4 Help program,” Ellis said. The program got its start in 2014 in Lake County, Ill. by a non-profit, Linking Efforts Against Drugs or LEADS. The Fulton County text line is funded by a grant from the Fulton-DeKalb Hospital Authority. The program was launched there in January at several high schools and will be expanded to include 10 more schools. GALLATIN COUNTY has joined 10 other counties to ban indoor vaping. The county health board recently voted to include electronic cigarettes in the county’s Clean Indoor Air Act policy, the Bozeman Daily Chronicle reported. The ban took effect last month. Anyone who violates the ban could be fined between $25 to $100. Shop owners could also face fines, depending on the number of violations. A county health officer said that enforcement will be driven by complaints. One vape shop owner said they plan a lawsuit, because customers need to be able to sample different flavors of “e-liquids” which they wouldn’t be able to do with the ban in place. The WASHOE COUNTY Sheriff’s Office offered free x-ray screening of candy on Halloween at the county courthouse, and for two days after at the District Courthouse and justice center, KOLO News reported. ● ONONDAGA COUNTY has been selected to join the Pritzker Fellows program, which gives grants to improve literacy for children age three and younger. This grant will go to the Early Childhood Alliance. The alliance will expand to include helping daycare providers give kids the foundation for early learning. It already fuels a campaign that encourages parents to talk, read and sing to their children starting at birth. ● Faced with a new state law that prohibits children from being housed in the same jails as adults, 11 counties are banding together to create a non-profit organization to build a regional jail specifically for children under the age of 18. Few counties in the Finger Lakes and Southern Tier have facilities to house children, so they must send them away to counties that do, often hours away. Under the new Raise the Age law, kids have to be in jails close to their families. A judge has ordered ALLEGHENY COUNTY and the city of Pittsburgh to release its bid for Amazon’s second headquarters. County Common Pleas Judge Terry O’Brien found no basis for the city and county to exempt details of their pitch under the Right to Know law, the Pittsburgh Post-Gazette reported. WTAE News has been seeking the release of the incentives the county and city offered the e-commerce giant. Nearly 300 homes in DORCHESTER COUNTY are being “moved” to BERKELEY COUNTY to fix a 121-year-old mapping error. The shift will give Berkeley County an additional $250,000 in annual property taxes, most of which will go toward its school district. The mapping error is believed to have been made by surveyors around the time Dorchester County was created in 1897, the Associated Press reported. HARRIS COUNTY has followed Houston’s lead in changing regulations to outlaw robot brothels. The county’s process of updating its rules surrounding sexually oriented businesses was accelerated when a Canadian business expressed interest in opening a location in Houston. The new regulations make it a violation to use “anthropomorphic devices” for sexual activities, Houston Public Media reported. UTAH COUNTY is suing Gov. Gary Herbert (R) for refusing to appoint any of its nominees to the board taking control of the Utah Transit Authority. Herbert has appointed members nominated by SALT LAKE and DAVIS counties, but hasn’t nominated two candidates forwarded by Utah County, in consultation with TOOLE COUNTY, The Salt Lake Tribune reported. Davis County consulted with WEBER and BOX ELDER counties. The Utah County Commission insists that state law requires Herbert to appoint one of its nominees and that the authority’s Board not be considered legally formed until a Utah County nominee is seated. DOOR COUNTY may find itself with a national park within its borders. The proposal for the Grand Traverse Islands National Park includes 17 islands, extending from Door County to Upper Michigan’s Garden Peninsula. The Grand Traverse Islands would house Native American archaeological sites, more than 40 shipwrecks and five 19th-century lighthouses. The proposal says hunting, commercial fishing, logging and mining would not be affected by the designation. Before the islands could have a national park designation, a study must first be approved and conducted by the National Park Service, WBAY News reported.